From Roses to Rainbows: Eli, Where Are You? Eli definitely leads an interesting life. He and Paul are always getting into trouble. He laughed at his friend when he got punched, and he laughed at the martini guy and nearly got beat up. I'm not sure about that track record, but all in all he's not such a bad guy. Holy cow how cool! I didn't expect the end! I think the mention of a pomegranate martini got me there. That sounds AMAZING!!! Thanks Katherine! I've never had a pomegranate martini but I think it would be good. Not what you would expect a swarmy guy to order, though. As it turned it is was for a woman. Those guys are always getting into something. He drank the invisible juice, yep, that's it. Tami, you've got to be careful what you drink in places like that. What a fun story about Eli:~) I love when you write fiction. You need to do it more often. My response to your question: I think Eli is dreaming and all he has to do is wake up! I can't believe your found that picture. That's great!!! Yeah, it's easier to do the fiction during a challenge. I look at the prompts and think about my selection of characters. There is another one coming up Friday if I can get it worked out in time. 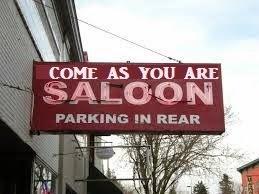 I googled "come as you are saloon" and got nothing so I looked for a picture I could modify. It's far from perfect, but I was pleased with it.